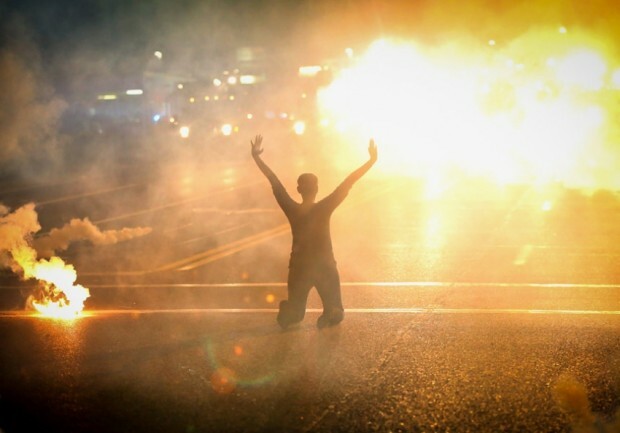 A woman kneels in the street as tear gas rains down. (CC licensed). Ferguson is burning. If you’re not burning with it, shame on your empathy-evacuated soul. On Aug. 9, police officer Darren Wilson shot and killed Michael Brown on a residential street in Ferguson, near St. Louis. He was 18 years old, unarmed. Some witnesses say he had his hands in the air in surrender as Wilson shot at him, a boy he told the grand jury had the face of “a demon.” Wilson, despite firing a grand total of 12 shots that day, was not indicted. No charges were leveled. That night, 29 people were arrested in violent protests that broke out throughout the city. Today, protestors are taking to the streets in cities such as New York, Washington D.C. Seattle, Los Angeles, Philadelphia and Chicago to protest the culture of violence that has pitted police against the people they vowed to protect. Protests like these have been going on since the shooting. It’s time we pay attention. Long past time. In a statement issued after the grand jury announced its decision, President Barack Obama called for “care and restraint” from law enforcement. These problems aren’t just problems for communities of color. They’re not just problems for people of color. We are all Ferguson. We are all Michael Brown. And like it or not, we are all Darren Wilson and Robert McCulloch, too. Brittney Cooper, a professor and Salon.com contributor, wrote a chilling essay about how she feels, as a black woman in America, in the aftermath of the decision. She writes, “If I have to begin by convincing you that Black Lives Matter, we have all already lost, haven’t we? So let’s not begin there. Let’s begin at the end. At the end there is only Michael Brown Jr’s dead body, no justice, and weeping and gnashing of teeth. I woke up this morning, a white woman in a world divided. I woke up angry, and sad and frustrated with the state of things. But I woke up unafraid of walking past a police officer. Unafraid of the cop car following me to work, or the humvees I passed at the armory down the street. Because that is my privilege. Because that is the America we live in, now. And if that doesn’t make you angry, you’ve forgotten why we founded this nation in the first place. Let me present to you the Boston Tea Party. Let me tell you about Martin Luther King. Let me quote to you Langston Hughes, who asked what happens to a dream deferred and let me whisper that the dream is still deferred, isn’t it, has been all these years, through 100 days of protests that scream about race relations, about police brutality, about inequality in a country that calls itself “post-racial,” a country that ignores one of the largest problems we’ve ever faced as a nation. Let me present to you the America we are today: A country that lets cities burn, that protects police vehicles instead of businesses, that hides behind the “rule of law,” instead of justice. There has been no justice for Brown, no justice for Ferguson. And as a white woman in a decidedly not post-racial America, I am ashamed. I am ashamed because I wear the skin that lets me walk free, and I am ashamed that there are skins that can’t, that won’t, in this “land of the free” that’s made a mockery of its own laws. If you, whatever color or texture or shape of your skin, do not feel as though you have been sucker-punched by Wilson, sucker-punched by McCulloch and yes, sucker-punched by our country as a whole, you’re part of the problem. Whenever a divisive issue occurs, hashtags blossom like poison flowers. #notallmen. #notallwhitepeople #notme #notme #notme. Yes, me. I’m sitting here gutted in my lily-white skin and I’m as stained with black blood as anyone. I’m sitting here in America, and I’m looking for change. I’m looking for way out, a way forward, a way to be the country we were promised when most of us, the us we were before we were born, stepped off a boat into a better life. That goes for everyone, no matter what skin you’re in. Previous On writing: It gots to get out. Pardon me for saying this, but Brown held up a store clerk, Brown robbed him, and then Brown attacked a police officer and went for his gun. This was confirmed by forensic evidence. The cases was handed to a jury of peers who looked over that evident, including the testimony of the nearby witnesses and they decided against taking the officer to trial. What more do you want? Justice isn’t decided by pre-conceived notions of race or racial appeasements. It’s decided by the facts which, in this case, were not in Michael Brown’s favor.